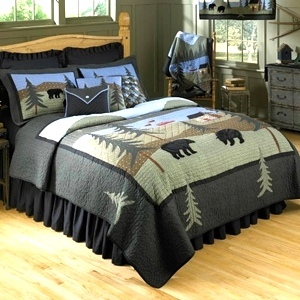 Bear Lake quilt collection is one of Donna Sharp's most popular patchwork quilts. It is a favorite of anyone wanting to add that rustic cabin feel to any home or cabin. Donna Sharp uses traditional, applique designs to create this exquisite patchwork quilt. Bear Lake features fabrics of green, blue, browns and blacks with some red accents. Bear Lake fabrics are hand cut and machine pieced and machine quilted. Bear Lake is 100% cotton, oversized, and reversible.